Q: Doesn't this video contradict the study guides? It recommends taking a practice test right away, but the study schedule doesn't mention it. A: For those following our study guides, which should really be all of you ;), you may have noticed that you are not schedule to take a practice test until week three or four. In the video we recommend taking a practice test as soon as possible. I could make an argument for both. On the one hand, you want to save your practice tests. So not wasting one at the beginning seems wise. On the other hand, by not taking a test at the beginning, you are going to be less aware of your weakness. So you need to decide where you stand. If you already have a strong grasp of your strengths and weaknesses, you can save the practice test until later. But if you are starting out and don't have a clear idea of your level, then you probably want to take a practice test right away. That way you know what to focus on in your studies. Q: Could you explain a little more about the increase in difficulty level in the Quantitative Comparison problems that Chris talks about? A: The math section will always begin with either seven or eight QC questions. Within that set of questions, generally (though not guaranteed), the later questions are more difficult than the earlier questions. In light of that typical pattern, it may be a good strategy to skip the last couple of QC problems, especially if you're struggling with them or pressed for time. Once you've moved beyond the QC problems, the difficulty levels of the next questions follow a different pattern, one that doesn't have any established trend (in other words, the difficulty level of one question in relation to another is more random). In this video, we are going to talk about pacing and the ability to skip questions. Now first off, I'm going to tell you something that that is mind blowing, at least from the GRE standpoint. Here it is, every question is worth the same number of points. Wow! Why is that so mind blowing? What's going on here with this statement? Well, I think almost everybody who takes this test assumes that the hard questions are worth more points, the medium questions are worth slightly fewer points than that, and of course the easy questions are worth the least number of points. It's intuitive; it must be the case. But it isn't. Again, every question is worth Same number of points. So what does that actually mean in terms of pacing. Well, do the questions that you find easy, because the easy questions are worth the same number of points as the hard questions. So why waste your time with a really difficult question. Two minutes have gone by and you are, really, no closer to the answer than when you started, versus using those two minutes to solve easy questions. So I like to think of this as a tree; this is--please pardon my artwork. Okay, that's tree-ish enough. Here are fruits on the tree. Fruit's way up here, and maybe you've heard of this expression before: the low-hanging fruit. Assume that every one of these fruits is an orange or an apple, and that fruit is the exact same. That is, this apple is no different from this apple is no different from this apple. If you wanted to pick three apples, where would you pick them from? you're down here. You're not a massive giraffe. It makes sense that you would go for the low-hanging fruit; the easy fruit. The GRE is the same way. Identify those questions that are easy, and go to those questions. Another way of saying it is do the easy test, the test that for you is easy. Now this comes down to the next important point is yes, you can skip questions. And the reason that this is so mind-blowing is the old GRE, well, you weren't allowed to skip a question. You had to answer it before moving on, and that was very stressful, and it's something that the new GRE wanted to change. So what you have now is the ability to scroll- to go from question to question to find the easy test. Mind you, I wouldn't scroll all the time just looking for a question that's easy and then skipping the medium ones, but I would definitely use the scroll feature to avoid the difficult questions. Remember on the medium section for either math or verbal, that is the first section you receive for either math or verbal, will have some difficult questions on it. It will have a bunch of medium questions, as well as some easy questions. Find the easy questions and the medium questions by using the easy to use scroll feature, and that way get, as many points as you can in as little time as possible or before the time runs out. Now, to figure out what is an easy test for you it's a good to have an idea which tests questions are harder, which ones are time drainers, etc. Now first off this test is section adaptive. 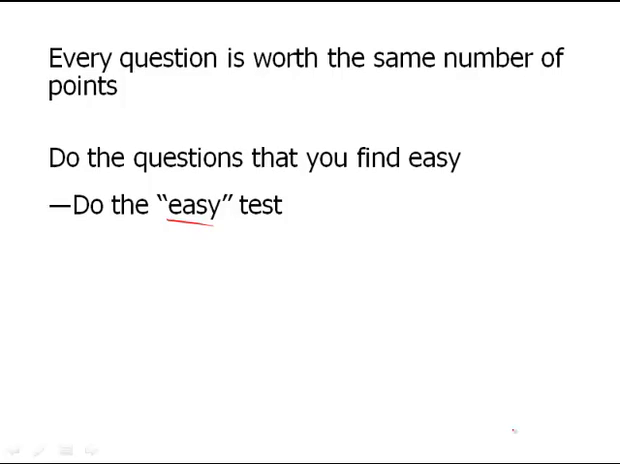 I went over this in an earlier video, and essentially what this is saying is the test does not become harder within the section, that is question five is not more difficult than question three, which is more difficult than question one, etc. Rather, difficulty within a section is random, but depending on how you do in the section determines your next section, the section you get afterwards, and that's why the new GRE is a section-adaptive test. However there's one section that is the quantitative comparison section. The quantitative comparison, in which the questions tend to get more difficult as you go up in number. you will either have a section that has quantitative comparison questions from one to seven, or another section you will get will have one to eight, meaning that six and seven and seven and eight tend to be more difficult than one and two. And that way, from a pacing standpoint, you know that, okay, it's a good idea to do the first four or five questions same here, and then maybe skip the harder ones, especially if you are pressed for time on the math section. Now if you are very strong in math then you may just want to go through each question as long as you don't get flustered and hit the wall as far as trying to find the answer goes. You may want to go just all the way to seven and continue going. But, again, if you're not that confident in math it's very important to know the harder questions in quantitative comparison. Again they start the math section 1-7, 1-8 tend to get a little more difficult. So don't get flustered doing problem solving. And look for the problems that are easy. Now, in terms of question types and the amount of time they take, let's talk about the time-consuming ones. First off, text completions, and you may balk, say wait a second, no no no, I don't agree with this, because that one blank text completion is easy! And I agree! But what about that two blank, or even the dreaded three blank text completions. Those are the ones that are going to take you a long time. So instead of sitting there and trying to dissect this sentence with four commas and a semicolon. Skip it. Scroll, go onto something else, choose another question, and again when I say scroll, maybe this sounds confusing to you, I encourage you to take a mock test as soon as you can through GRE, or through rather the GRE creators ETS, or through Magoosh, we'll talk about that in a second but again going back to here and what's time consuming. Three blank text completions and some of the two blank text completions can take up a lot of your time. Then there's reading comprehension. Not all passages, but there are a couple of long ones. In fact there's one very long one and one long one. Both of those have only four questions after them, so skip those, come to them at the end. And then there are paragraph argument questions Again not all of these are difficult. And you maybe want to give question a shot. Read it, but if you're actually thinkng wow this is a long paragraph and they're asking me to do a lot and understand a lot and, wow, it's really confusing. Again, don't think "I'm not good at this", think, "Ah, I have encountered a difficult problem. And now I will skip this and come back to it if I have time. Now I mentioned a second ago about These practice tests. It's one thing to here me talk about the scroll feature, How different questions take more time. And you have to kind of find your own strategy so you can find the easy test. Or the long hanging fruit. But nothing can really prepare you the way that taking actual mock tests can. Actual practice tests. You'll pick up on the scroll feature really easily, and as far as, again, finding the questions that are easy for you, you'll develop a sense of that. So, we have here PowerPrep 2. This is the one from ETS that I mentioned a second ago. These are the writers of the test, Educational Testing Service; they write the GRE and they have here these two PowerPrep 2 tests. And the reason why it's called PowerPrep 2 is that PowerPrep 1 was for the old GRE. So again, Power Prep 2 has two tests and you can get those with the official guide, they come on a little CD. And, then of course, there's also Magoosh mock tests. So you can create a bunch of mock tests using the magoosh questions themselves and this will give you the exact feel of taking the GRE in terms of the scrolling, even in terms of the calculator, it's like sitting there and taking the real test. So here you have it, these are the important strategies you need to know in order to pace so you don't run out of time. So you go for the easy and medium questions first.